Laois worked hard for a 1-11 to 0-11 win in this Bank of Ireland All-Ireland football qualifier clash with Derry in Croke Park today. The O'Moore men looked in deep trouble when they trailed by four points at half-time after failing to get any attacking momentum going. But Mick O'Dwyer freshened up his offensive unit and turned the game around with substitutes Stephen Kelly and Gary Kavanagh crafting and executing vital scores, while in midfielder Noel Garvan had the sort of inspirational influence needed to turn the game around. Early scores from centre back Tom Kelly and Ross Munnelly gave Laois a promising start, but despite enjoying territorial supremacy for much of the opening quarter, they failed to make it count. Munnelly looked menacing but after he hit his second point from play in the 18th minute, Sean Marty Lockhart was assigned to shadow the Laois danger man and the threat was immediately diminished. Even when presented with relatively easy placed ball opportunities, Munnelly failed to deliver. It was point for point throughout the opening 22 minutes with Enda Muldoon, Paddy Bradley and Paul Murphy on target for the Ulstermen. The final 10 minutes of the half belonged to Mickey Moran's side. With Fergal Doherty growing in strength at midfield and wing backs Francis McEldowney an Padraig Kelly increasingly influential, they took the game to the beaten Leinster finalists. After Kelly had put them in front for the first time in the 25th minute, further scores followed from Johnny McBride and Murphy, before Bradley showed his class with two gems. Padraig Clancy pulled back a late point, but Derry enjoyed an 0-8 to 0-4 advantage at the break. The sides were level within seven minutes of the restart. 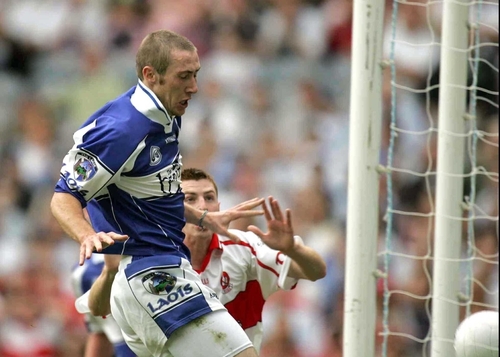 First Noel Garvan received a brilliant pass from Stephen Kelly in midfield and had the vision to fist it to Billy Sheehan who palmed home a goal. Seconds later, substitute Kelly hit the equaliser and Gary Kavanagh put them a point ahead. The lead, however, didn't last long. Mark Lynch eased the Oak Leafers back in front at the beginning of the final quarter with the game still balanced on a knife-edge. But Laois had the answers with Garvan and Padraig Clancy getting on top at midfield and Kelly ever willing to press forward, they took the game fearlessly to their opponents. Points from Munnelly and Donie Brennan opened out a three-point gap with just five minutes to play and Derry just had nothing more to offer. Laois: F Byron, A Fennelly, D Rooney, J Higgins, C Begley, T Kelly (0-1), P McMahon, N Garvan (0-1), P Clancy (0-1), R Munnelly (0-4, 1 free), K Fitzpatrick, B Sheehan (1-1), D Brennan (0-1), S Cooke, C Conway. Derry: B Gillis, K McGuckin, K McCloy, G O'Kane, F McEldowney, SM Lockhart, P Kelly (0-1), Patsy Bradley, F Doherty, P Murphy (0-2), E Bradley (0-1), J McBride (0-1), M Lynch (0-1), Paddy Bradley (0-4, 1 free), E Muldoon (0-1, free).